In the second year of a new ownership, the Fresno Grizzlies have changed their looks. The new look is built upon the Growlifornia look, the club used during themed days in the past few seasons. The new look contains new colors, new logos and new uniforms. 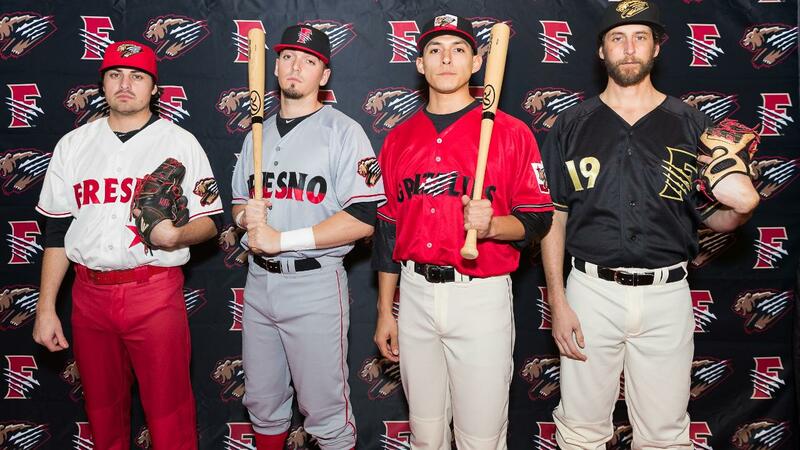 The scarlet, black, gold and beige scheme will be the Fresno Grizzlies’ new permanent look. In the first year of the affiliation as the AAA team of the Washington Nationals in the Pacific Coast League, the Fresno Sports & Events ownership group developed the new look together with San Diego-based Brandiose. The collaboration of the new Fresno look was also led by Grizzlies’ graphic designer Dorian Castro, who is working for five years with the organization. Castro, a Central Valley and Fresno County native, lent the local flair and his expertise of the region to the brand refresh. The new look for Fresno’s Triple-A club builds on the “Farm Grown” and “Growlifornia” branding that has been central to the club’s identity, beginning in 2015. The new uniforms contain a grey road uni, a crimson and white alternate 1 uni, a black and white alternate 2 uni and a special home uniform. The home uniform is a nod to the Californian flag as it sports a red star and a red band at the bottom of the jersey which fits fine with the red pants that come with it. The team will stick to the bear scratch theme that has been part of the Grizzlies for years. The F, that was used as their cap logo will be used on the road cap but in red instead of orange. All of the caps that come with the various uniforms will sport the bear scratch. The caps shown below are (clockwise) home, road, alt 2 and alt 1.